Event Taps Testbench is a free utility for software developers. Use it to explore what your applications can do with Quartz Event Taps. It is also a useful tool to test virtual software input devices, assistive applications for persons with disabilities, remote control software, and drivers for hardware input devices such as trackballs and tablets. 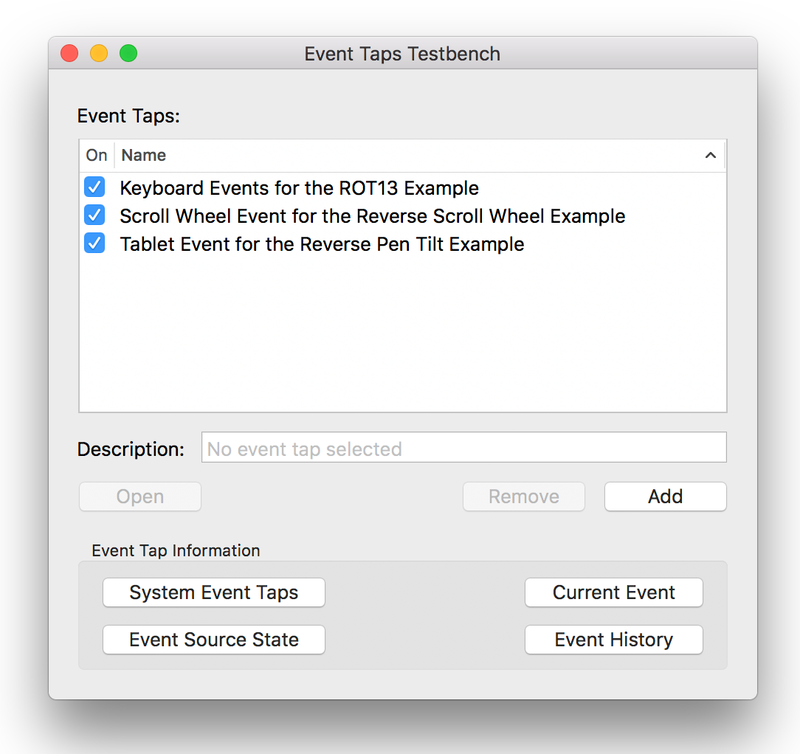 Event Taps Testbench is free. Requires Mac OS X Lion 10.7 or later; verified through macOS Mojave 10.14. Event taps are Core Graphics objects that an application can install in the system to monitor and respond to user input to any application from a keyboard, mouse, trackpad, scroll wheel, tablet or tablet pointer. Using Event Taps Testbench, configure and install as many event taps as you like and monitor user input events in real time. In addition, configure how the event taps respond to user input by performing the example actions provided, by blocking or modifying user input before the events are posted to their targets, and by posting additional events before and after the original event is posted. In addition to being useful in its own right, Event Taps Testbench allows you to explore our PFEventTaps Framework. Go to PFiddlesoft Frameworks for information about downloading, using, and licensing the PFiddlesoft Frameworks, including the PFEventTaps Framework. There, you can also download the source code for Event Taps Testbench to serve as sample code showing how to use the framework. Event Taps Testbench incorporates the PFEventTaps Framework as an embedded framework. Go to Event Taps Testbench Support for a note about new security requirements in macOS Mojave 10.14. This page was first published by PFiddlesoft on May 25, 2010 and last updated on October 22, 2018. Copyright © 2003-2018 Bill Cheeseman. Used by permission. All Rights Reserved. PFiddlesoft and the PFiddlesoft logo are trademarks of PreForm Assistive Technologies, LLC.